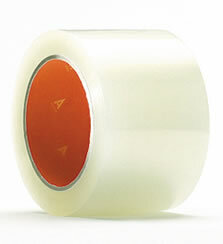 Specially formulated solvent acrylic tape provides excellent bonding at refrigeration temperatures found in the food-processing industry. Super-tack adhesive formulation provides excellent bond to recycled cartons and other difficult surfaces. Aggressive initial tack, better hold and improved age resistance create a high level of application performance in a wide variety of environmental conditions. Specially formulated acrylic adhesive for cold temperature applications and storage. Excellent choice for hard-to-adhere-to surfaces. Exceptional results in dusty or dirty conditions. Great for standard corrugated packaging and recycled cartons. Solvent resistance is excellent for applications with exposure to fuels, solvents, and other industrial chemicals.